The RED color is actually the brightest on setting 11 with GREEN being the second brightest with BLUE being the third. However by changing the 2032 battery to TWO 2016 batteries the BLUE and GREEN really blast! But when you do that the lower settings are also much brighter and the battery life is deminished. The BLUE is very easy on the eyes in the low light. The camera makes it look brighter then it really is but it is brighter then the GREEN on setting 1. I haven't heard of an LED that has 3 colors to cycle through. hmmmm. Interesting idea. The LEDs I use are 5000 mcd and I think the by colored ones are much much lower. One thing I did discover during EA's bullet testing the last few weeks. In a snow covered environment Green is better then blue. The sky reflecting off the snow has a blue hue making it hard to see the blue reticule. Green does not have this issue. It's not a matter of how bright but color frequencies. Look at the snow in this pic. Its very accurate in showing how the snow had a blue hue. This is why when you want colors to stand out from each other you pick one opposite each other on a color wheel. Remember if you use two 2016 batteries it will make it brighter. Holy crap. Now THAT is a color wheel. For me, red and orange works best for any electric or analog sight system. Green gets washed out in bright sunlight and grass, as Jay has posited, blue is not great for snow. 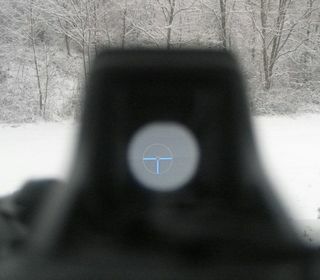 I think there is a reason most red dots sights use... red dots. Btw, I am in LOVE with that retical. I'm sure yall have heard me say it, but the G36 and P90 use it... I still haven't been able to find the same retical in any sight that mounts to a picatinny/AR, any thoughts? But the blue and green got a mr. factor like no other. At the end of the day though, red is the most versatile. "Rods Do Not See Red! Red rose at twilight: In bright light, the color-sensitive cones are predominant and we see a brilliant red rose with somewhat more subdued green leaves. But at twilight, the less-sensitive cones begin to shut down for the night, and most of the vision comes from the rods. The rods pick up the green from the leaves much more strongly than the red from the petals, so the green leaves become brighter than the red petals! The ship captain has red instrument lights. Since the rods do not respond to red, the captain can gain full dark-adapted vision with the rods with which to watch for icebergs and other obstacles outside. It would be undesirable to examine anything with white light even for a moment, because the attainment of optimum night-vision may take up to a half-hour. Red lights do not spoil it. These phenomena arise from the nature of the rod-dominated dark-adapted vision, called scotopic vision." Nothing compares to the Color Sphere http://greg.org/archive/2007/08/08/phil ... kugel.html" onclick="window.open(this.href);return false; this one isn't as impressive as an actual sphere a student painted for one of my profs back in college. The outside of the sphere was painted like the linked image, but then it split in half and the inside plain was the dark and light tones for each color. An absurd amount of work. All hand painted and colors mixed by hand. "Although they are much more light sensitive than the green and red cones, it is not enough to overcome their disadvantage in numbers. However, the blue sensitivity of our final visual perception is comparable to that of red and green, suggesting that there is a somewhat selective "blue amplifier" somewhere in the visual processing in the brain." Thanks for the post, very informative. I read the article. So for low light, green truglos give best visibility. In the light, orange/red will be the best indicators. but if you want a light that won't interfere with your natural night vision, red is the best. * i imagine this is why most recitals are red, you want to see your crosshairs on your target, not just your glowing crosshairs. This is of course only a real necessity in tactical or hunting situations,. With target shooting and the like this will not matter so i vote blue or green! Am i getting it wrong or can you change the color on the black ring sights? Or was it just an option to make the tritium light up with the black ring and the color options are only for the original white ring sights? ???? What? :huh: To clarify... I make the REM T3 that illuminates the tritium for the White ring sight AND I make the REM T3b that illuminates the tritium for the Black ring sight. I install for free the T3b to your Black ring sight but you can do it yourself. The color you choose illuminates the Tritium bar. so both sights can have the color change? cool. I wasn't sure if there was a difference between the two sights in how they were illuminated. "got it in the mail today. this little ps90 add on is why america is great. ppl think it is the constitution, or our founding fathers, both of which are obviously great. but really why we are an amazing nation is because of ppl like you. everyday americans who see a problem and fix it. the culture that allows each of us to be an entrepreneur, that no idea is stupid, and everyone can make a difference is what makes this place the best place on earth. sorry to be such a cheese fest, I'm just impressed at this side business you started, and while you can definitely tell the product is made by somebody outside a normal mfg line, it is one of the greatest things I've purchased in a long time. and believe me, I buy a lot of top end [stuff]. I feel privileged that you let me buy your craftsmanship. :gavel: As of today 7/6/15 all future orders are Backordered about 60 days. I am having aluminum molds made so once the new REMs start coming off the line there will be a price reduction. I am shooting for around $50 each. I'll post the new price once we get closer to full production.